The very name Stonham can strike fear into anyone who drives a lot in Suffolk. The speed trap at the crossroads on the A120 through Stonham Parva seem to have caught just about everyone who uses that road regularly - just think of how many points it has put on East Anglian driving licences! But there are two other Stonhams. Stonham Aspal is further up the A1120 towards Framlingham, and is home to the famous Stonham Barns. 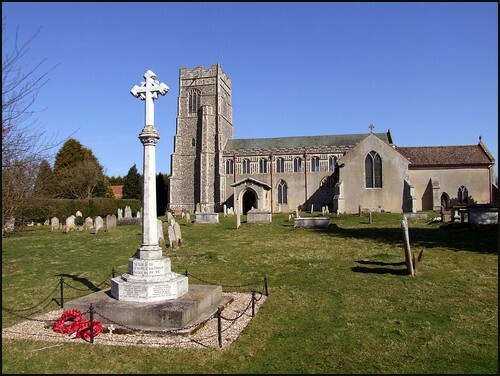 But the least known of the three is Earl Stonham, despite the fact that it has one of the most interesting parish churches in the middle part of the county. St Mary is a grand, cruciform building with a 15th century west tower, resting sedately in the middle of a large graveyard. It is such a handsome building that the grey cement rendering seems unfortunate. I first came here about ten years ago, soon after I started visiting Suffolk's medieval churches in earnest. St Mary features in Roy Tricker's pleasing book of his favourite fifty Suffolk churches, and so I had read aout it in some depth before I came here. It was exactly the right thing to do: Earl Stonham's is an interesting and significant church which doesn't necessarily reveal itself easily, and there is nothing more satisfactory than wandering around a place like this muttering "Aha!" and "There it is!" and "Isn't that fascinating!" as I did back in 1998. I've been back here several times since, and always enjoyed the experience, in no small part due to having read that account of the building first. St Mary is open to visitors every day, partly as a consequence of being in the first wave of churches funded by Andrew Lloyd Webber's Open Churches Trust. Today, of course, virtually all East Anglia's churches are open every day, but this wasn't the case twenty years ago, and so we have plenty to thank Lloyd Webber for, despite the musicals. As you walk up the long path towards the church, the overwhelming impression is of the beautiful clerestory picked out with flint flushwork. The great west door is original, its intricate patternwork weathered by the centuries. But you enter through the south door, via a simple porch. At first sight, the inside used to seem slightly gloomy; not least because it was rather cluttered, in a not unendearing manner. However, over the last five years the interior has been pleasingly refurbished and is now neat and tidy. Still, the lack of aisles, and the way that the clerestory makes the nave lighter above our heads than at eye level, the impulse is to look up, and see one of the most glorious hammerbeam roofs in East Anglia; indeed, in all England. I used to think that the rich red colour was a result of it being made of chestnut, but in fact this roof is oak. The intricate carvings are warm and glorious. For my money, only Blythburgh can beat it for beauty, Mildenhall and Needham Market for interest. Alternate hammerbeams are false ones, for decoration; these are the ones with the pendant pineapple decorations. Green men look down leeringly, while above them animals sport in the foliage of the spandrels. The font sits grandly now that the space around it has been cleared. It is a slightly battered twin to that at nearby Creeting St Peter, and perhaps the recutting there was based on this one. From here, the eye is led towards the crossing. Ahead, the chancel is almost completely Victorianised; as at Great Bealings, it appears to float, full of colour and light, above the nave. Above the chancel arch are the remains of a doom painting. It shows the Last Judgement, with souls being measured, and then sent south to Hell or north to Heaven. The middle part of the painting is rather empty, suggesting that the rood went up this high. It would have been lit by the small window near the roof of the north transept. On the west wall of the south transept is a painting, a scene from St George and the Dragon. It is rather cut off by the organ, making it difficult to photograph I curse that I missed the opportunity to photograph it properly when the organ was removed for repair a few years ago). Opposite, until the 1930s, it was still possible to discern what appeared to be the martyrdom of the disgraced St Thomas of Canterbury. This is a rare subject in East Anglia, being found at only a couple of churches. Another wall painting, in the south transept, showed the nativity, and was probably part of a sequence like that at North Cove or Wissington. It has been whitewashed again, but a modern transcript of an 1870s copy is on display. There are also medieval benches, and one opposite the door bears a dedicatory inscription: Orate pro [anima] Necolai Houk ('Pray for [the soul of] Nicolas Hook'). The pulpit here has a series of three egg-timers behind it, with which an 18th century preacher could keep tabs on the length of his sermon. Simon Jenkins says that they were intended to make sure he didn't cut it short, rather than to stop him going on too long. They time a quarter, half and three-quarters of an hour. Stepping up into the chancel, There's some good 19th century carving, but some medieval carvings too. One of them shows a bagpiper, rather different from the same thing at Honington. Back in 2000, when most churches had the pleasant luxury of deciding what their Millennium project should be, the parish here had rather more pressing concerns. The bell tower was beginning to separate from the back of the church, and so drastic renovation work was needed to both the tower and the bells themselves. As part of this project, the ringing chamber was lowered to be in full view of the congregation, a kitchen and toilet were added to the vestry area, and the medieval pews were moved to the north transept to create a quiet area for contemplation. Today, St Mary is an utterly lovely church which, despite its size, has a thoroughly homely feel. Beneath the great roof, the light falls through ancient window tracery onto simple, devotional fittings. The deep silence of the wide graveyard fills the interior, a space which it is always a pleasure to visit, and to explore, and to just sit and be still in the presence of something beyond our everyday material existence.